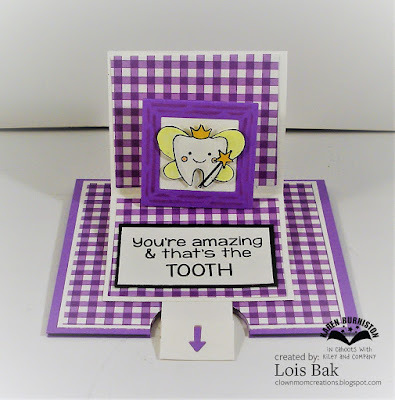 Maryann ends her month as hostess for the CCEE Stampers by telling us that today is Tooth Fairy Day and asks us to include a fairy on our cards. It just so happens that Kindred Stamps has a stamp-of-the-month club for Wacky Holidays, and this month's stamp is also celebrating Tooth Fairy Day. How fortuitous!!! 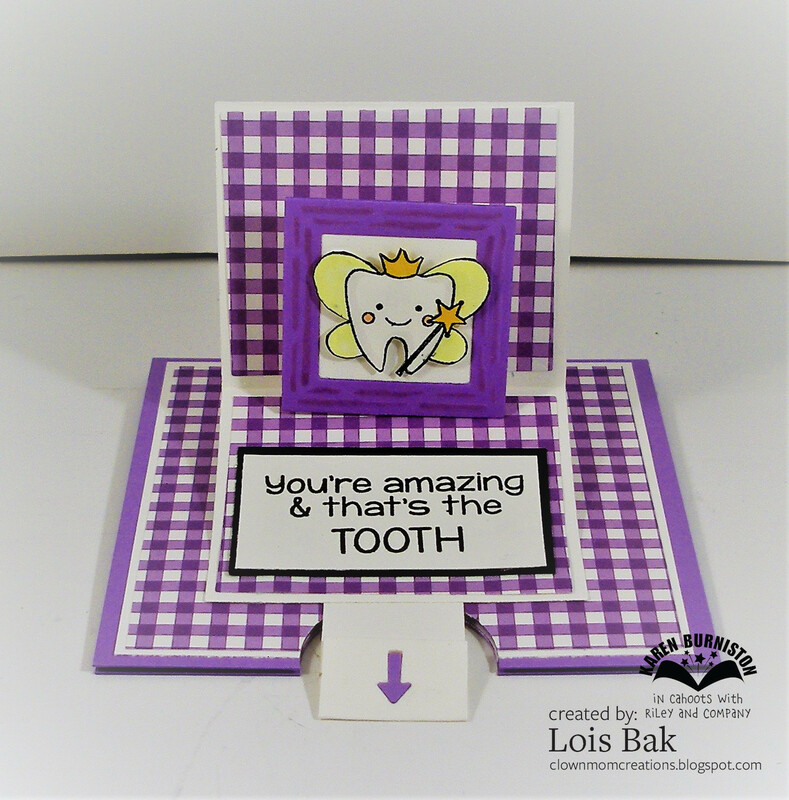 I pulled out my Karen Burniston Frame Pull Pop-Up die and made this card, which I have sent to my dentist. 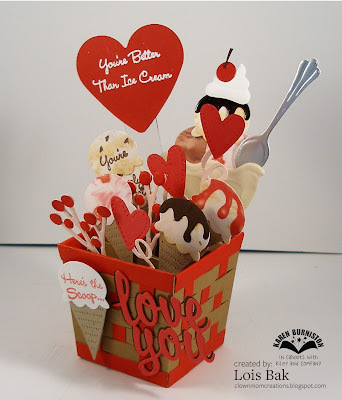 I hope he likes it! 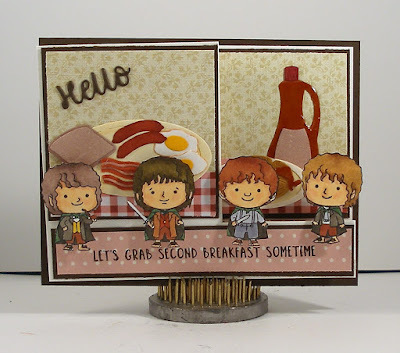 Be sure to check out the CCEE Stampers blog for some more fairy cards. 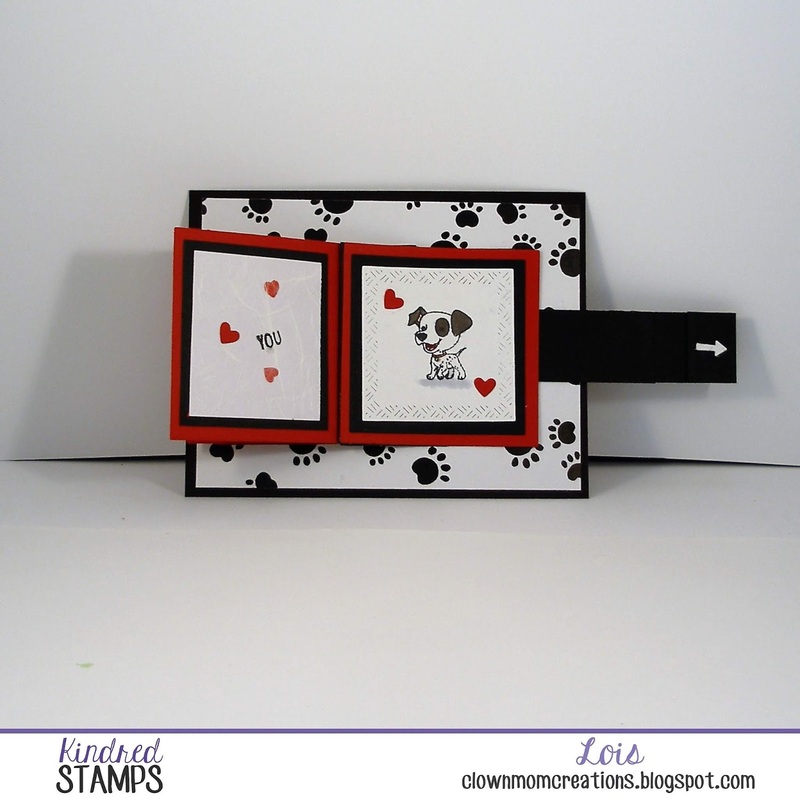 Maryann continues as hostess for the CCEE Stampers, and this week she asked us to make an interactive card -- specifically a LEVER CARD. 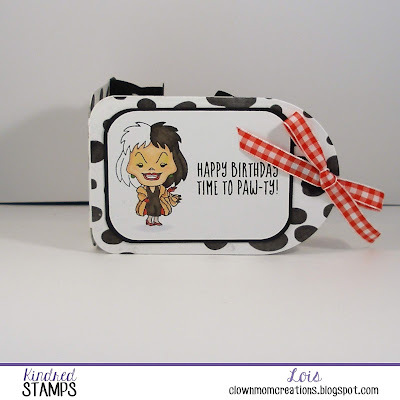 I had never made one of these before, so I looked at the Splitcoaststampers tutorial she referenced. I used a fun Kindred Stamps set called Science Geeks and some "geeky" patterned paper for my card. Check out the CCEE Stampers blog to see some more lever cards; and, if you've never made one, I invite you to give it a try! 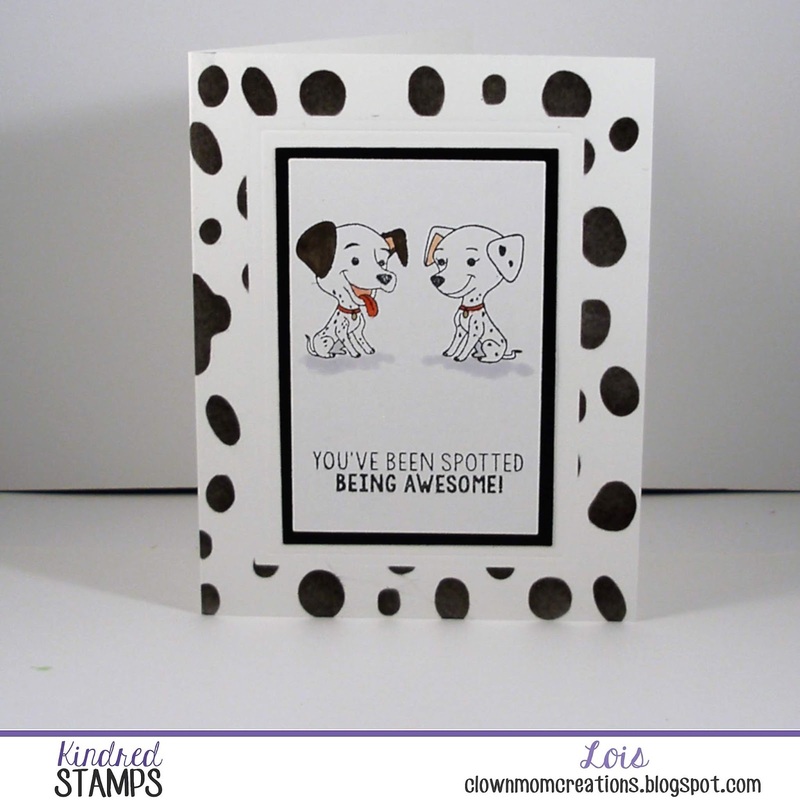 I have another brand-new stamp set from Kindred Stamps to show you today -- A Bit Spotted. 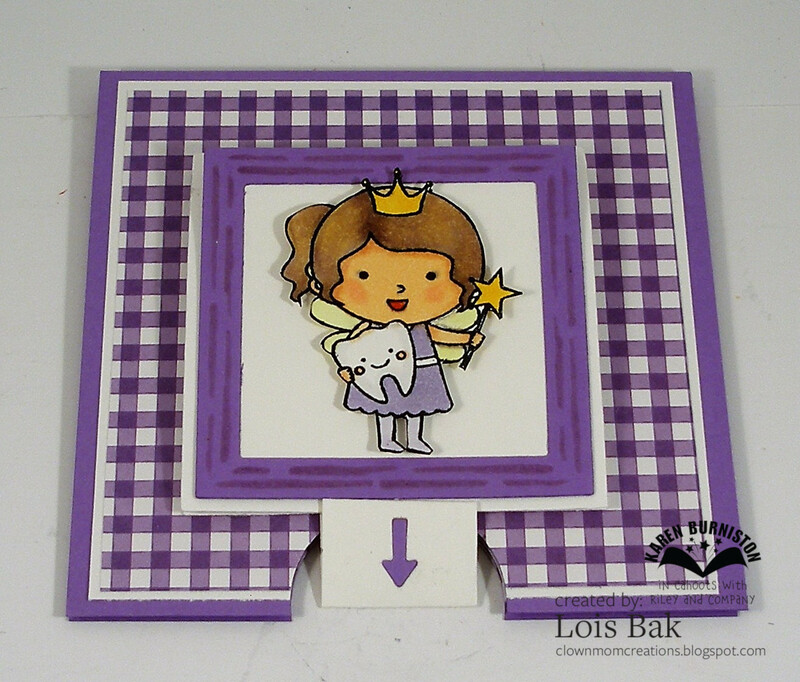 It's a small set (4" x 4") but has quite a few images in it. There is also a stencil which coordinates very nicely with the set. I used it on two of my cards. 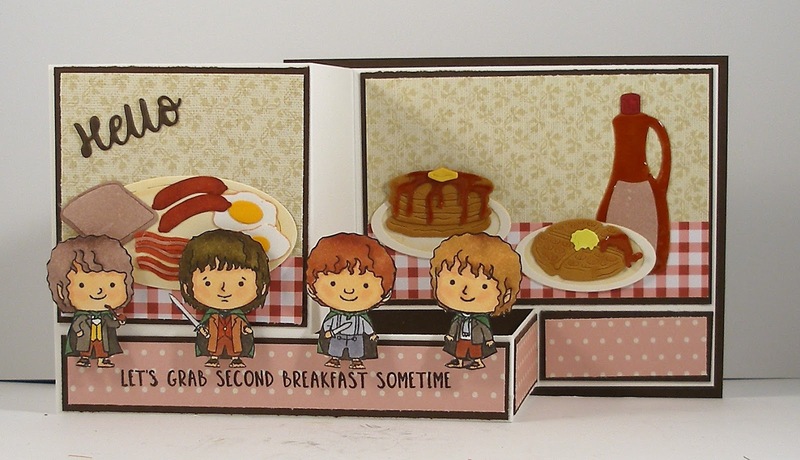 I have a soft spot in my heart for this set because, as a kid, I had a Dalmatian named Patches. 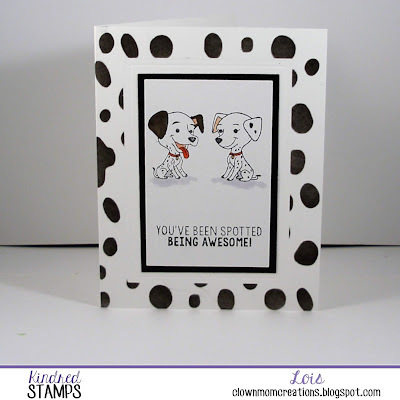 As you probably know, Dalmatians are sometimes called Firehouse dogs. This was during the time when many people still smoked cigarettes. I don't know if this trait was inbred or what; but, if someone threw a cigarette onto the ground, Patches would pounce on it, as if to put out the lit portion of the cigarette. My father's friends would throw down cigarettes on purpose, just to see Patches do his little trick! 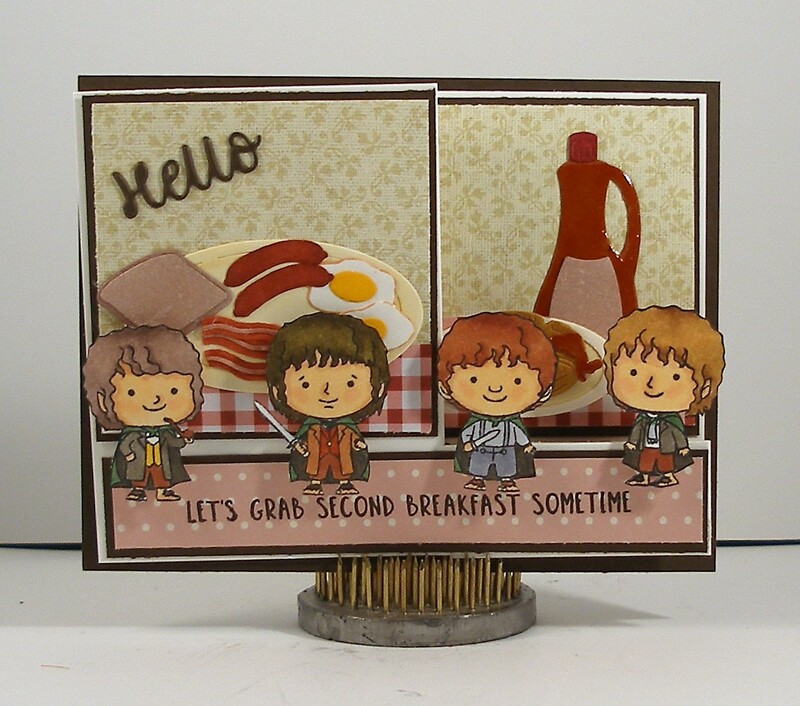 Anyway, I have three cards to show you today -- one is simple and the other two are more interactive. 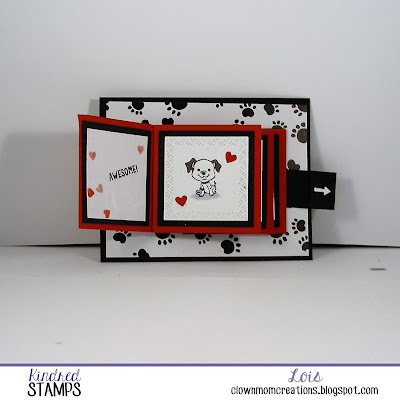 This set lends itself very nicely to a Red/White/Black color combination, and all three cards use that color combination. 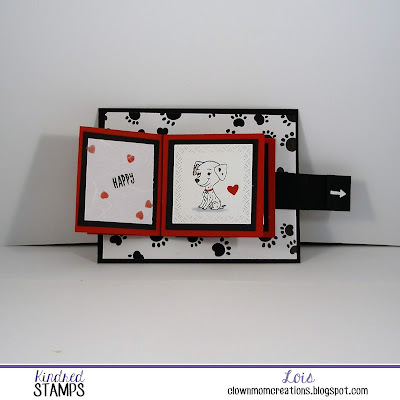 The first one is a tag book card made with the Karen Burniston Circle Tag Book Pop Up die. I used the smaller set of coordinating stickers on the inside of this card -- and the stencil on both the inside and the outside. My second card is the clean and simple one, although I did dress it up just a little. 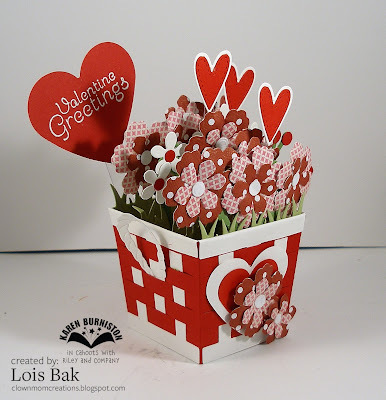 I masked the center of the card front, sponged the "frame" around the outside using the stencil, and then embossed with a rectangular die. 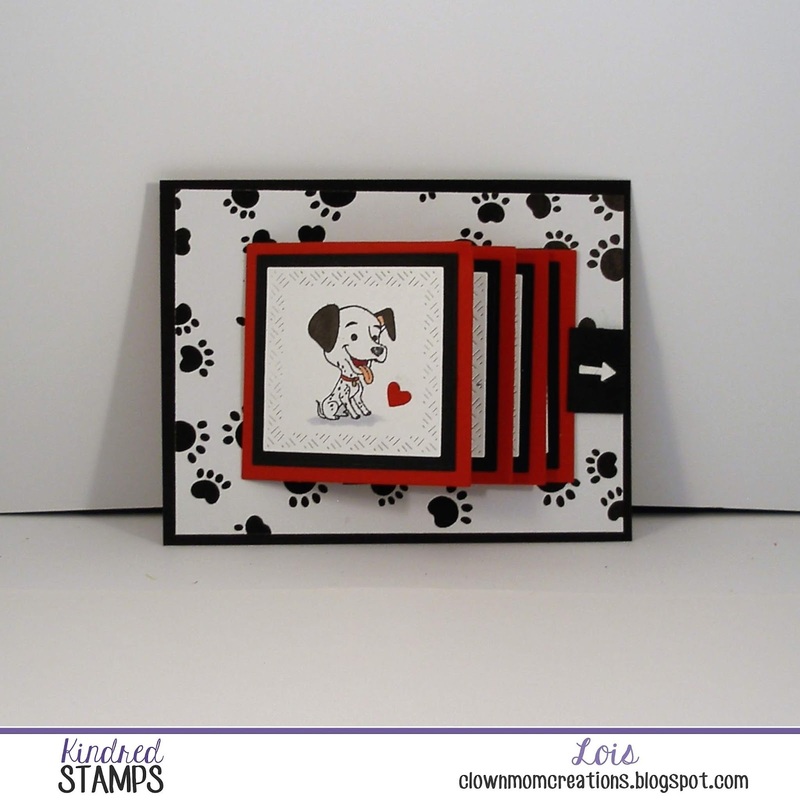 After stamping and coloring the two dogs, I matted that piece and adhered it to the center. My final card is a waterfall card, which I made using the Karen Burniston Frame Pull Pop-Up die. Notice on the inside panels, I pulled out some random words from the three sentiment stamps in this set and stamped them on the left-hand panels. There is space on the back of the card to sign your name. 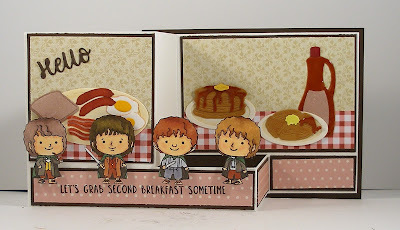 I hope you like what I did with this set. It was lots of fun and brought back some memories from my childhood! 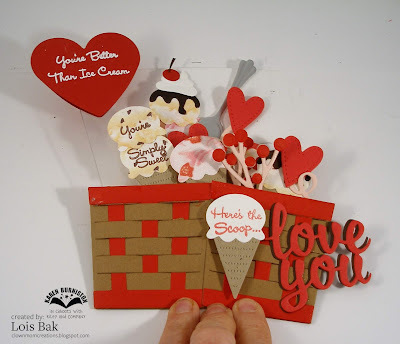 You don't usually build your card around a sentiment, but that's exactly what I did for my card today. As I was looking at Kindred Stamps' The Next Space Explorers, the Earl Grey sentiment struck me. As a tea-drinker, it was the perfect place to start. 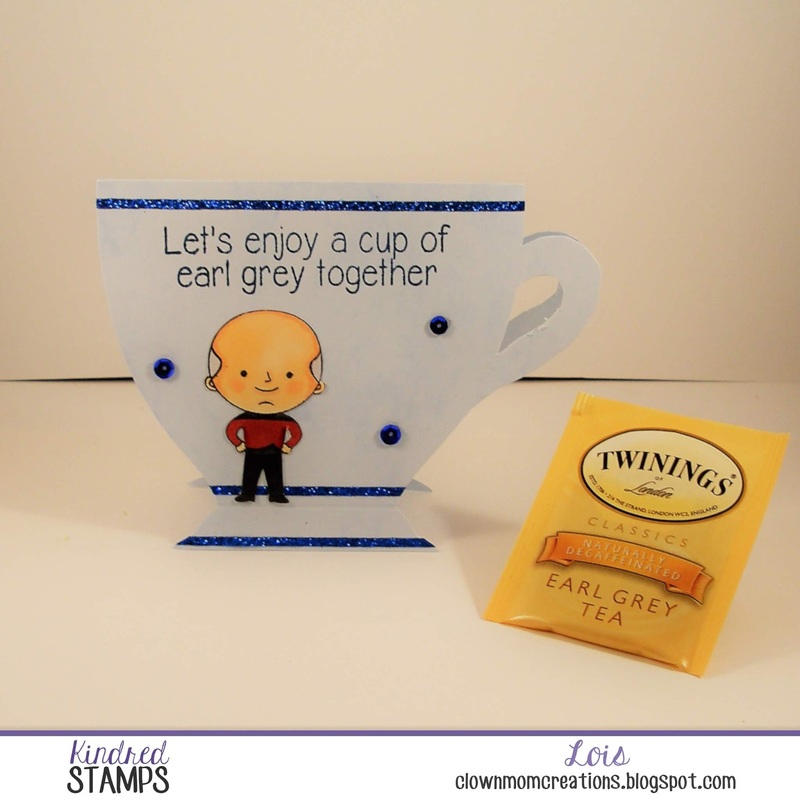 I went on-line and found a tea cup template and printed it out. After folding a piece of light blue cardstock, I laid the template along the fold and cut out my cup. I had found some narrow sparkly washi tape in Hobby Lobby last week, and it looked like the perfect trim for my tea cup. 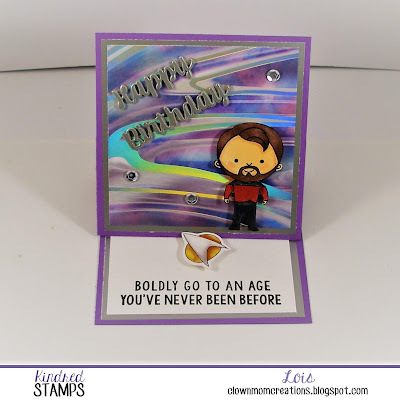 I then glued down my fussy-cut captain onto the cup and popped on some sequins. 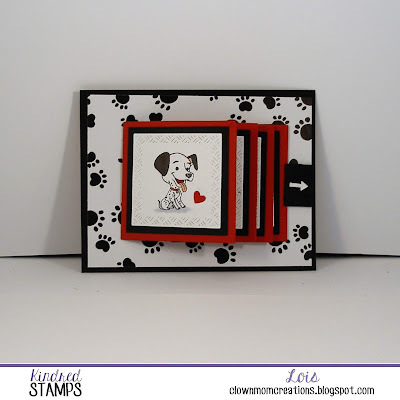 Maryann continues as the CCEE Stampers hostess for this Valentine's Day. She told us that it is also her birthday and asked us to make a birthday card for someone we love. 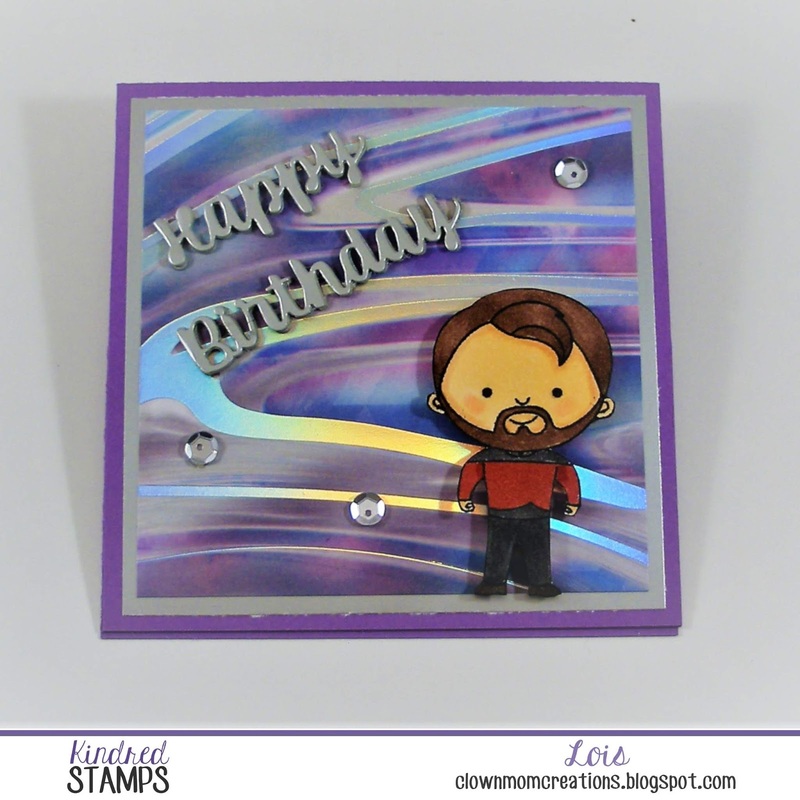 I'm not sure who will ultimately get this birthday card, but I have to tell you that I loved making it! I used the new Karen Burniston Woven Basket. As you can see, it folds flat for mailing. 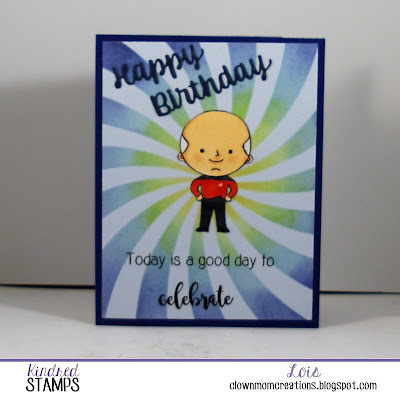 I invite you to hop over to the CCEE Stampers blog to see some more loving birthday cards. 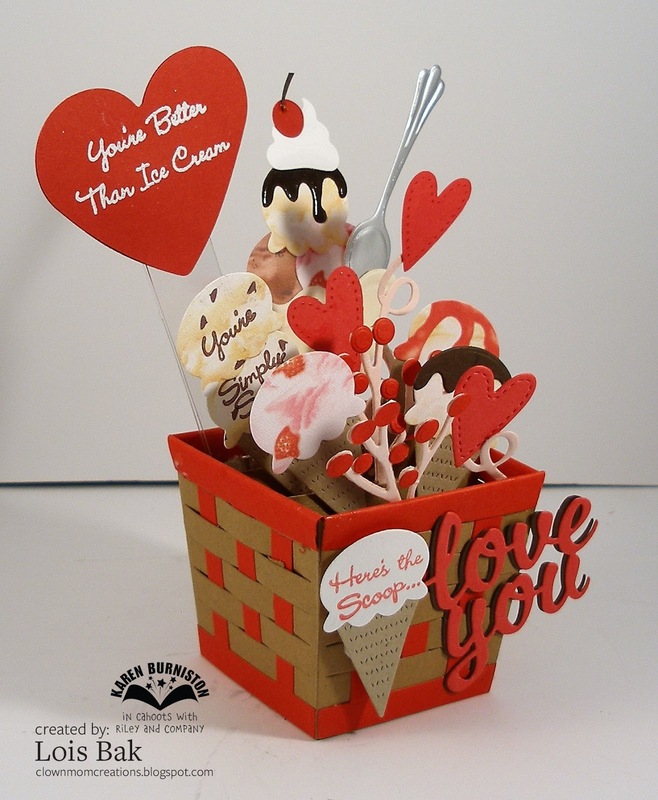 The Karen Burniston Woven Basket Pop-Up lends itself to so many different occasions. As you can see, today it's looking like Valentine's Day! 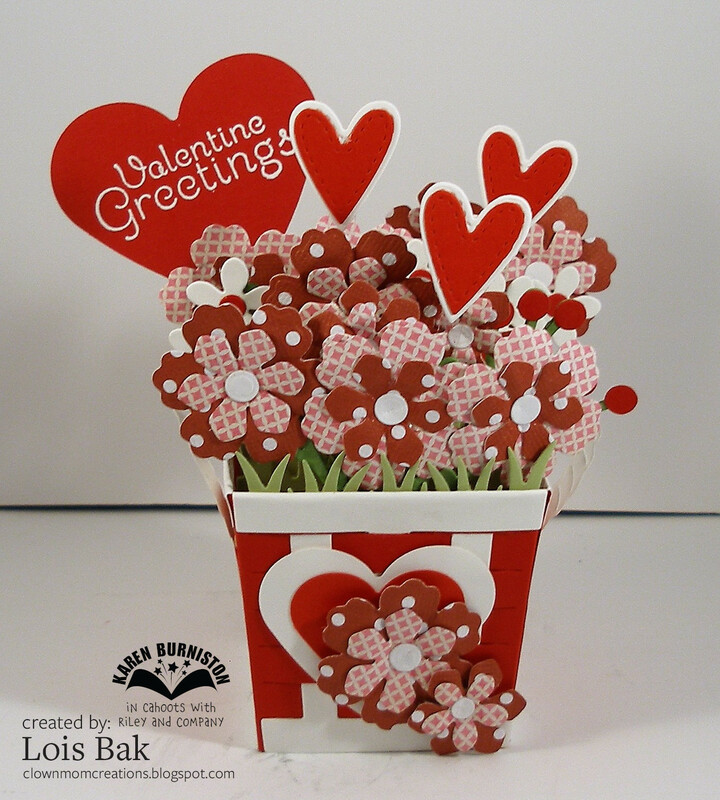 The large heart in the background was created by a punch (as were the two small, layered ones on the front), but the smaller ones within the bouquet are from the Karen Burniston Heart Pivot Panels die. 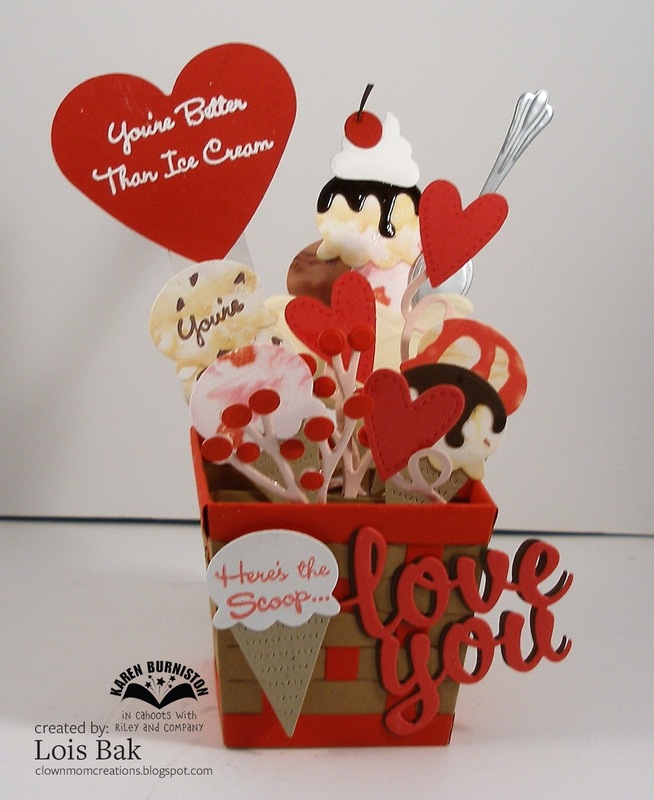 They worked so well on this Valentine. The two different sizes make layering very easy. I have already given this card to my Stampin' Up demonstrator -- the sentiment on the large heart is an old Stampin' Up sentiment stamp. She loved it! 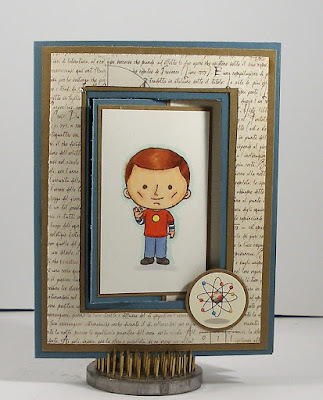 Masculine cards are not always the easiest ones to create; but, if the man or boy has a particular interest, it's much easier to create something personal. The card I have today is one that I'm sure would appeal to a sci-fi lover! 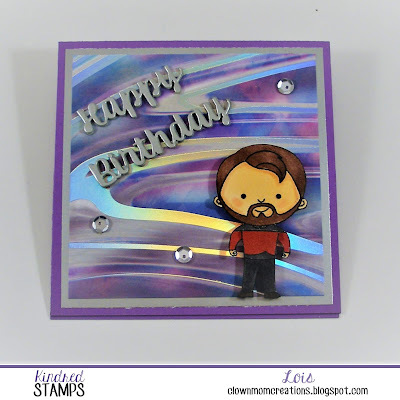 I used the Kindred Stamps set called The Next Space Explorers as well as one of their stencils. 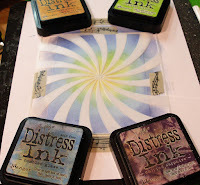 As you can see the background was made by sponging several different distress inks onto light blue cardstock -- using the Swirl stencil. 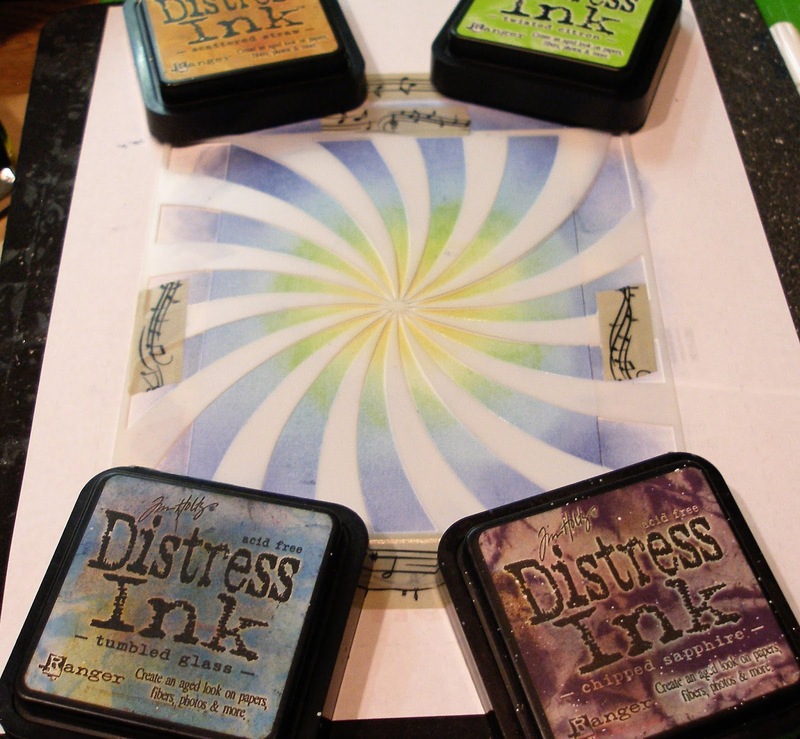 After sponging on all the colors, I cut the panel down to 4" x 5 1/4" -- to layer onto an A2 card base. 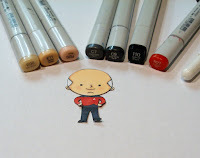 I stamped the Next Space Explorers captain onto a piece of white cardstock and colored him with Copic markers. The image itself did not have an emblem, so I improvised and drew a small emblem with a white gel pen. After fussy-cutting out the captain, I adhered him to the center of the swirly background, stamped the sentiment, and added a die-cut "Happy Birthday" greeting at the top -- then glued the panel to the navy blue card base. 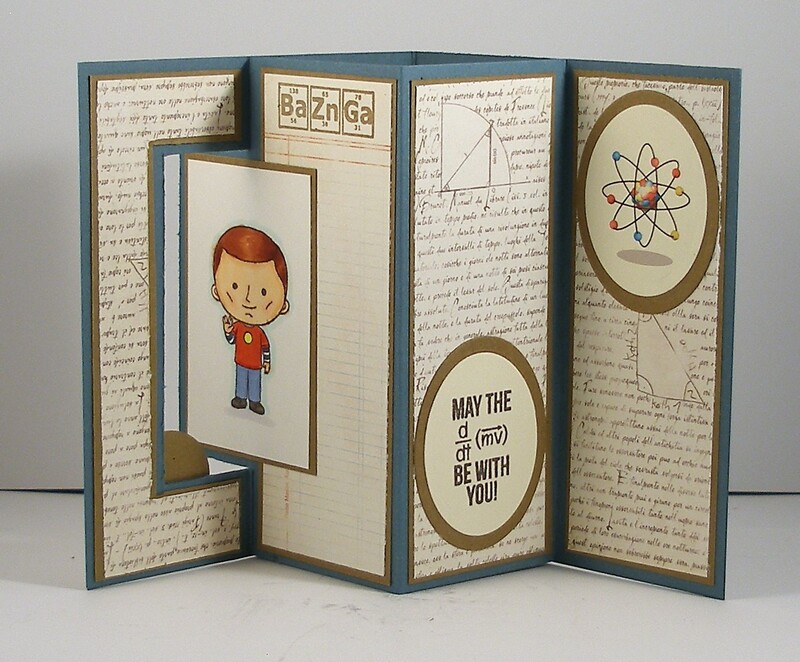 I think any space nerd would enjoy getting this card.